In the past year, dozens of Harvard postdocs–including several from the Molecular and Cellular Biology Department–have banded together into an organization that addresses postdocs’ unique needs through projects that include advocacy and hosting social and networking events. The Faculty of Arts and Sciences Postdoc Association (FASPDA)’s upcoming events include picnics, happy hours, and Postdoc Appreciation Week (September 18-22). The postdoc years can be extremely stressful due to a variety of factors: many postdoc positions are low-pay and without fixed appointment lengths. According to the FASPDA’s 2016 survey report, about 57% of Harvard postdocs are married and are likely juggling their family lives with searching for faculty positions, paying off loans, teaching, and working long hours in the lab. With all of the responsibilities, it can be easy to feel overwhelmed or let certain things fall by the wayside, but the FASPDA offers postdocs opportunities to connect with each other, interface with the university, and access career development resources. By fostering opportunities for postdocs to interact with each other both online and in person, the FASPDA hopes to both offer solutions to common postdoc problems and build a sense of community. For example, the association is planning to launch a Slack group with a channels devoted to postdocs in specific fields, postdocs from overseas, and postdocs who have kids, as well as channels that simply focus on hobbies and miscellaneous mutual interests. The goal is for the Slack group to serve as both an advice-swapping forum and a way to make friends and organize smaller events, such as hiking trips. The FASPDA hosts a wide range of events including job talks, excursions to local landmarks such as the MFA, and science cafes, where postdocs gather to hear their fellow postdocs give informal presentations about their work. Career development is a perennial concern for postdocs, and events that provide career advice and tips for securing grant funding have been among the most popular. For many events, the FASPDA coordinates with the Office of Postdoc Affairs and postdoc associations around the Greater Boston area. However, many postdocs who join the FASPDA just enjoy hearing each others’ stories and ideas. “When I heard about the FASPDA I thought it would be a great way to promote communication between people both at the scientific and personal level,” says postdoc Ana Pereira, who serves on the FASPDA’s finance committee. “Over the last year I learned a lot about the science done here in quite an informal and fun way as well as making many friends.” Syed says one of his favorite events so far was the FASPDA Symposium, where dozens of postdocs from different departments presented posters about their research. Over 100 people attended the symposium. The FASPDA will also continue organizing career-building and networking events, which are often co-sponsored by local biotech companies. 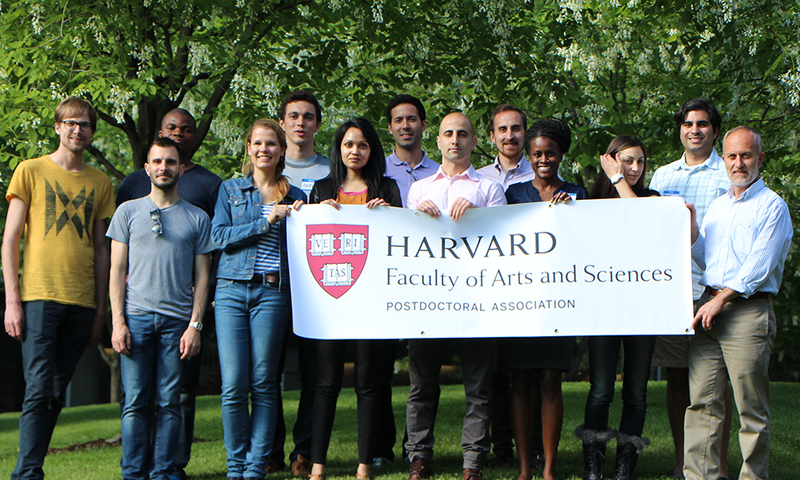 Although most Harvard postdocs hope to start their own research labs, helping postdocs build industry connections is a key part of the FASPDA’s mission. “I was especially interested in joining the career committee and help postdocs to enhance their skills and provide opportunities for them to learn about a potential transition to a non-academic career,” says MCB postdoc Chris Tijs, who collaborated with the Boston Postdoc Association to organize an industry networking symposium. Although many of the current leaders of the postdoc association are in science departments, particularly the MCB department, the postdoc association hopes to expand and include more postdocs from humanities and social sciences in their events and projects. 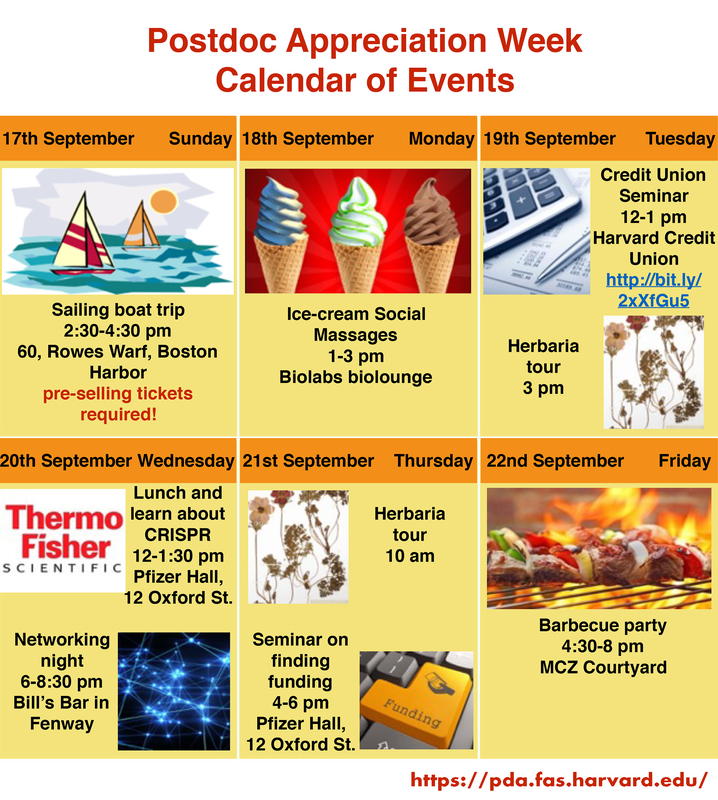 One of their big upcoming projects will be Postdoc Appreciation Week (September 18-22), which will include both Harvard-specific events–including an ice cream social and a sailing trip–and joint events with other Boston area postdoc associations, such as a Trivia Night at the Aeronaut Brewing Company.